New author: We’re excited to introduce Debra Maslowski, our new staff writer. Debra is a master gardener, a certified herbalist, a natural living instructor and more. Debra will contribute one article per week and her expertise will bring a plethora of new topics to DIYNatural.com. Please make her feel welcome! As winter is winding down, we’re all tired of being cooped up inside. We get a few warm days when we can wander around the yard and wish we could plant something, just to get a jump-start on spring. While we can’t plant tomatoes and peppers yet, there is a surprising amount of things that can be started now. Early every year, as soon as the ground can be worked, I set out radish seeds. I live in the mountains of North Carolina now, and winters tend to be mild here. But I come from some of the roughest country there is to try to plant – Minnesota. When the snow melts and the ground is soft enough, get out there! You can get those radishes going, and much more. How about cabbage? All of the brassicas – cabbage, kale, brussel sprouts, broccoli – can all be started now. Spinach, kohlrabi, swiss chard and all of the lettuces can be started now too. So once you start getting lots of lettuce, there is often a need to find new recipes. Man (or woman) cannot live by salad alone! Here’s an old family favorite recipe for when you have an abundance of lettuce. It works well with chard, spinach, and some mustards too. Chop or tear lettuce. Set aside. Mix vinegar and sugar together and set aside. Fry bacon and reserve oil. Cut bacon into small pieces. Toss lettuce and bacon into hot oil, pouring vinegar/sugar mixture over the top while stirring. Serve hot. We used to love this treat. The lettuce would wilt and become coated with the sugar and oil. It was a wonderful sweet and salty combination on a cool spring day. Well, if you can do it in Minnesota, I can do it in Ohio! Thanks for an awesome article. This post is amazing. I realy love it! Thanks so much for all the encouragement everyone. I look forward to working with DIYNatural and am having fun with it already. 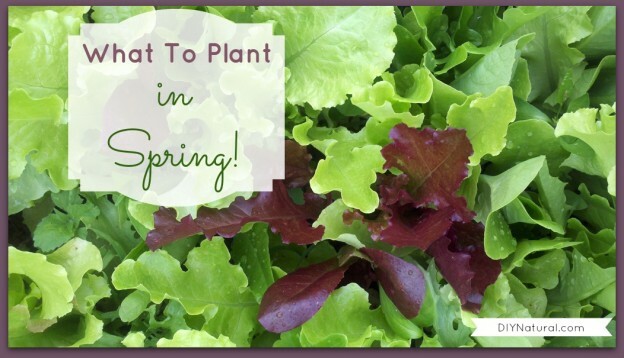 Stay tuned for more gardening ideas and healthy living options! Welcome! And thanks for this post. I’m sure you have all your topics lined up, but just in case you’re up to suggestions, my husband & I are condo-dwellers and don’t have a common open area for planting anything. Any suggestions for what we could grow indoors, and equipment we might need? I”m in your situation Melanie, so any suggestions in condo gardens would be great. (We are lucky enough to have a tiny yard and deck where I hope to put some window boxes and a topsy turvey. Also want to try some big pots.) When you have limited space, you learn to be creative! I am in the process of putting together an aquaponics system, you can use gold fish. The idea is the fish poo provides the fertilizer for the veggies, check out ytube you can set up indoors-foot print doesn’t look too big and you can raise veggies year round. Actually, I’m working on an aquaponics set-up myself. I have 2 ponds that have goldfish and sunfish. They get along quite well. I then have 2 small tanks that have floatin “rafts” with pots in them. I wanted to get going right away and not wait for rockwool, so I tried bamboo fiber from the fabric store. I just happened to have some. I used that in my pots for the growing medium and it worked great. It’s natural and organic and will biodegrade over time. So a month later my lettuce is about 2 inches high and my spinach is about 3 inches. I’m setting up bigger tanks this spring and I’ll keep you updated! Thanks! I’m so excited to be here! I don’t have ALL of my articles figured out yet, but I’ll appreciate any suggestions. I’ve been in your shoes before in apartments and condo’s. Lighting is the hardest thing, then keeping the plants watered evnly is a challenge too. Get a full spectrum or daylight bulb. Placing yur plants by a window just won’t work in most cases. I was told by a rep from Anderson Windows that most of the newer windows are UV coated, so they won’t let UV light in. Great for your curtains and carpet, but your plants need the UV light, so the light usually needs to be supplemented. With the water issue, take a soda bottle and clean it well. Then poke a few holes, very small holes, in the sides of the bottom. Directly on the bottom could cause compaction. Then dig a hole about a third of the way up the bottle, and place the bottle in the hole, firming up the soil around the bottle. Fill it with water. It will gradually trickle out and keep the soil evenly moist. I have been doing this for years. Already have lettuce, cilantro and some herbs growing. Welcome to the team! Thanks so much! What part of the country do you live in? My herbs wintered over well, and of course the lettuce, but I haven’t gotten my cilantro started yet. I also have peas, chard, beets, and onions and garlic going. It’s gong to be in the 70’s here this weekend, so I’ll be able to do a lot more. I have made this salad recipe several times and it is excellent, I would encourage all to try it. I’m going to try it with chard this year. Never tried it, but it should be good! I wonder how Kale would work…? As a novice gardener from MN would you recommend to using seeds or seedlings for the brassicas, spinach, kohlrabi, chard and lettuce? My first year planting lettuce I used seedlings and had a fantastic turnout. Another year I tried seeds and intercropping method and failed. As for starting seedlings indoors (this also did not go well for me) once your peas, for example, sprout their roots in the bag, do you then go on to plant them in soil indoors, or leave them in the bag. Novice question, right!? Thanks! Don’t ever hesitate to ask any questions, no matter how simple they might seem. Sometimes when you start indoors it’s too soon, your plants will get leggy, or burned by the sun when you first put them out. Try to start your seeds inside 4-6 weeks before the last expected frost. In Minnesota, where I’m from, it can vary, but generally Mother’s Day (Haha and opening fishing!) is around the last frost date. And you can cover if it freezes later. You need good light, a full spectrum or daylight bulb is best. And change out your bulb every 6 months. After this time, they can lose up to half their intensity. You might not notice, but your plants will. And for the peas, harden them off by placing them in a shaded location outside during the day for a few days. Bring them in at night. Then plant them in your garden. You can also direct sow, but it’s faster starting them in the bag. I know what you mean. Waiting is the hardest part! I run out of patience and start trimming outer leaves way too soon, but it grows fast, so don’t worry. Can I use a natural substitute like xylitol in the recipe? Also could I substitute lemon juice for the vinegar? We started gardening two years ago and are still learning!! So glad you will be giving us tips and other info once a week. I look forward to your future columns. Thanks Marilyn. I’ve never tried to use a sugar substitute in this recipe, but I’ve had success with agave syrup in some recipes, and stevia in some others. I can only say try it, and adjust your recipe based on how it turns out. You can substitute lemon juice. I’ve found vinegar is more acidic and breaks the “fat” taste, but lemon juice should work fine. And thanks for the encouragement. I look forward to a long run with DIYNatural. I love making wilted lettuce in the summer with our lettuces. With my recipe that mom made and I’ve revised to cut out so much fat, the dressing is made on the stove and is then poured over the lettuce. That way it wilts but isn’t too wilty! Here’s my recipe that is posted on my hubby’s blog since he grows all of the lettuce. http://www.ourhappyacres.com/2012/11/classic-wilted-lettuce-salad/ It’s truly a sign that summer is here when I make this salad. Yum! Thanks Lynda. I’ll give it a try and let you know. I grew up loving this wilted lettuce. My mother would make it all the time with the fresh lettuce out of our garden. This brought back happy memories. Thank you. It has always been one of my favorites. Glad I brought back some happy memories!